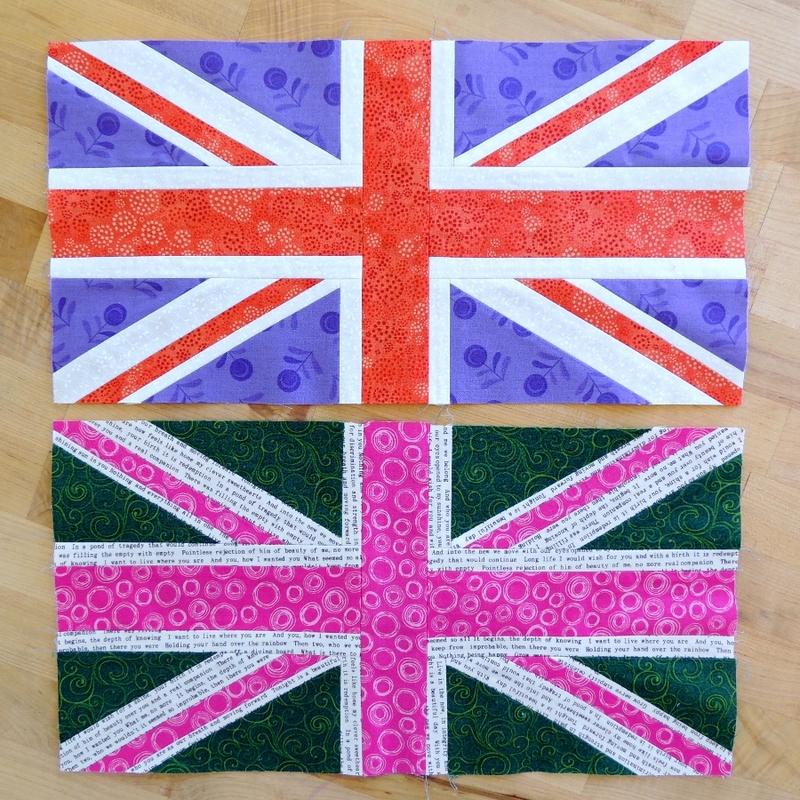 Kristen asked for 2 blocks following Molli Sparkles’ Union Jack tutorial but using an assortment of colors (although the traditional blue and red could have been used, I chose to go with the non-traditional groupings below). It seemed like a complicated block and I definitely took my time piecing the first one, but it turned out to be worth it because the second block came together much faster! Kristen wants to know if we have any exciting or unusual summer plans. Other than a few short weekend trips to visit family and go camping, right now nothing too exciting or unusual is planned for me. Your blocks are perfect, Yvonne! I especially like the traditional colours of the first one… But the green and pink play nicely too. Great job! Hey! I made my mum a tray mat using his tutorial! It’s a good one. 🙂 Yours turned out great, and I can totally relate to the it looks a bit complicated, oh no, feeling. But if you go through his steps, which are very clear, then you get a wonderful result, such as you have! I like the interesting colour combos too. Fun! I love these blocks, it is such a great design and looks so cute in all sorts of different colors. Lovely blocks! 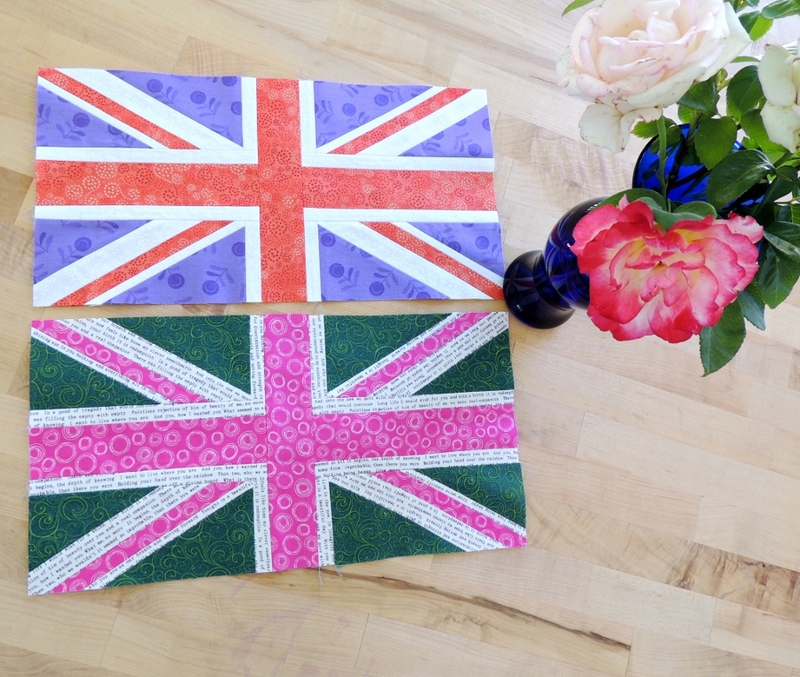 The Union Jack flag lends itself so well to patchwork, doesn’t it? This block is still on my bucket list! It’s nice to see your color combinations, it gives me so many ideas! I just made a few Union Jacks myself to send to Granny Maud’s Girl. But I used her paper pieced tutorial. Made those skinny strips very doable. And I used Sunprint Text as well. Great minds think alike! Sun print text, eh, Jennifer? Now I have a clue about what is arriving! I don’t know how I missed Molli’s tutorial when I made my paper-pieced pattern. I guess there is a method for everyone now – with paper and without. These look great! I really like the pink one. I’m liking the non traditional colours best – especially the use of the text print. It would be interesting to see how this quilt turns out. As much as I love bright colours, I’m having trouble picturing a quilt full of just really colourful Union Jacks. I think I’m not patriotic enough for it!